The dates are confirmed as the 2nd and 3rd of May 2009. The headline sponsor for this year is Etnies.Massive props go out to Pete Turvey at Soletech for sorting out the main sponsorship of the event. The other main sponsor this year is once again Relentless. This year the first day of the event will held at Dumbarton and the second leg will be in Aberdeen. If the skating that went down at the War of the Roses on 21st / 22nd Feb is anything to go by there should be a lot of sick skating going down. Transition in Aberdeen have added some new stuff to session on the Sunday which looks pretty rad. Best tricks on various obstacles. Cash prizes for sponsored riders and product for un-sponsored riders. The price for getting into the parks is the usual £10 quid each day on the door. Well worth it for a whole days skating. The Second day will not start until 2pm and there will be barbeque food on offer for tea. 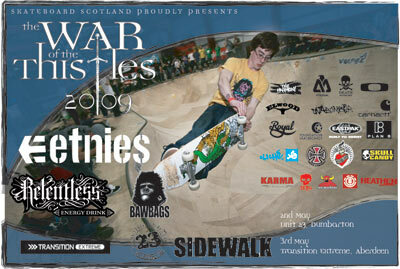 Skateboard Scotland would like to thank all the sponsors whose support helps make War of the Thistles the awesome event it is! Etnies, Relentless, Bawbags, The Harmony, Death Skateboards, Matix, Oakley, Elwood, Unabomber, Carhartt, Royal, Foundation Skateboards, Eastpak, Plan B, Cliché, Independent, A Third Foot, Skull Candy, Karma, Zero, Toy Machine, Element, Heathen, Unit 23, Transition Skateparkand anyone else we’ve forgotten!! !